North Dakota History: Journal of the Northern Plains welcomes new and timely topics and new treatments about North Dakota and northern plains history, institutional history, archaeology, architecture, historic preservation, or ethnic history. The topic should be interesting or meaningful to a significant proportion of North Dakota History's diverse readership, which includes professional historians, dedicated amateurs, and general readers with varying levels of interest in history. 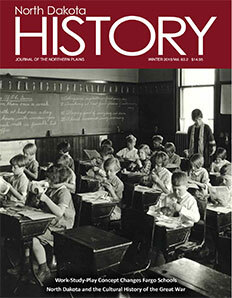 North Dakota History is a refereed journal. Manuscripts deemed potentially appropriate for the journal are reviewed anonymously by staff of the society, members of the journal’s editorial advisory board, and other appropriate scholars. Manuscripts are evaluated on originality, significance, quality of research, and presentation, among other factors. This is a double-blind process—neither the author’s identity nor the reviewers’ are revealed to one another. Manuscripts should be 5,000 to 6,000 words in length, excluding endnotes. Send one hard copy and one copy electronically as a Microsoft Word document or a PDF. Authors must submit properly identified copies or a descriptive list of suggested photographs and illustrations with the manuscript. Do not send original photos. Use a double-spaced format, with one-inch margins on each side. Double space quotes and endnotes. Pages must be numbered consecutively. Articles must be properly documented. Endnotes for direct quotations and for facts, figures, and dates from primary and secondary sources are required. Citations must be complete and follow the most recent edition of The Chicago Manual of Style published by the University of Chicago Press. For additional guidance, please consult recent issues of the journal. Identify the author and provide any other information about the author only on the cover page, not in the manuscript. Previously published articles and manuscripts being considered for publication elsewhere will not be accepted. Edited, annotated documents, and other unpublished primary materials about the state’s history and that of the northern plains also are welcome. Personal reminiscences and genealogical studies are typically not considered for publication in this journal. Editorial review typically takes six months following receipt of a manuscript. The editor will contact the author, summarizing reviewers’ comments and requesting any suggested or required revisions. Upon acceptance of the manuscript, the author will be asked to sign an author’s agreement transferring copyright to the State Historical Society of North Dakota and guaranteeing the work is original and not previously published. An author may request written permission to reprint/reuse his or her own work. Refusal to sign the author’s agreements rescinds acceptance of the manuscript. The author must acquire permission to publish all archival and copyrighted materials (quotations, photographs, maps, etc.) that are part of the author’s article but not original with the author, and also provide proper credit citations. Authors should also provide suggested captions for selected photos. The editors reserve the right to make changes to the title and the text. Authors are provided ten copies of the issue bearing their article. Reviewers selected to evaluate manuscripts receive the guidelines below. Authors may find the criteria helpful in guiding their work. Does this manuscript . . .
Show responsible scholarship? Is there a clearly stated thesis that is explained or justified; does it recognize and deal with opposing viewpoints or counter-arguments? To what extent has the author researched and assimilated the published information relevant to the topic? Does the article merit the attention and respect of those who may not agree with it? Contain innovative information? Does it make a significant contribution to the literature? Does it present creative insights, opinions, or syntheses? Does it offer new factual or survey data? Demonstrate the author is in command of the topic and the level at which it is being addressed? Present a topic likely to be interesting or meaningful to a significant proportion of North Dakota History’s diverse readership, which includes professional historians, dedicated amateurs, and general readers of varied levels of expertise? Have good organization, structure, and style? Is it well documented? Is the writing style either too casual for a formal publication or too complex for a general reader to follow?